Vine & Olive's diver scallops. Naomi Boutz is an accomplished woman: a graduate of Lewis Clark State College's business administration program who considered law school, an avid triathlete and a former server at the Wine Cellar who worked up to manager and wine steward at the Cellar (the second iteration of the currently shuttered downtown Coeur d'Alene restaurant). Yet she's humbled by the response to her new Coeur d'Alene business, Vine & Olive Eatery and Wine Bar. "I'm finding people are very fierce in their support," says Boutz, whose restaurant planning has been several years in the works. All 120 wine club bins have been spoken for (the restaurant is adding 32 additional bins to meet demand), and she's been delighted by visits and well-wishes stretching back through her career to her high school years in St. Maries, Idaho. Boutz's vision for Vine & Olive was specific and client-focused from the outset: European-inspired shared plates featuring local, seasonal ingredients; a chic décor with rustic accents (meaning no televisions), an emphasis on Northwest wines and a modest price-point. 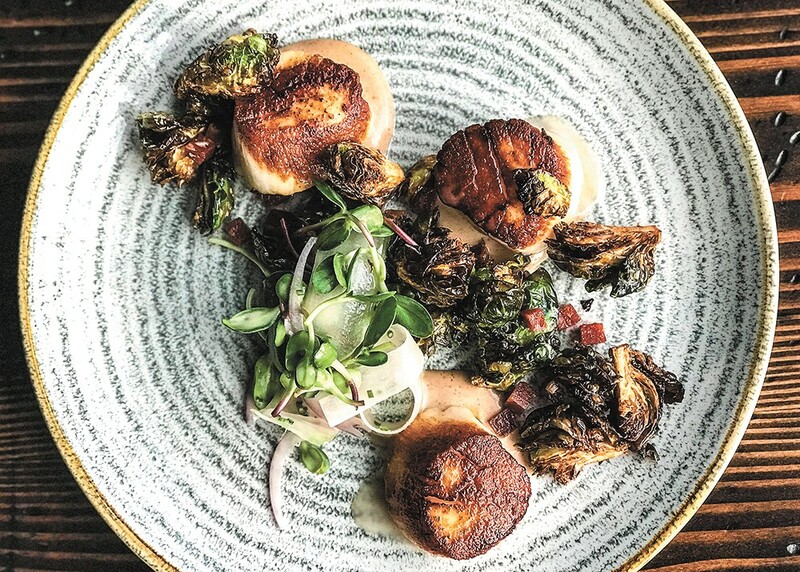 The menu features mostly shareable dishes, a few entrees — all but the diver scallops ($26) are priced under $20 — and desserts. Pair crunchy chickpeas ($3) or lightly fried acorn squash ($6) with Vine & Olive's eight rotating beers. Sink into braised short ribs with creamy polenta ($18) or share flatbread ($10) and what Boutz calls a "superfood salad" of ancient grains: farro cooked tender in apple cider with kale, microgreens, roasted red pepper, cold-smoked apple, and red wine vinaigrette that's topped with fried farro and shaved Fontina cheese ($7). Everything is scratch-made (except the restaurant's bread, which is sourced from Pilgrim's Market), including chef Paul Mason's pasta, which will spoil diners from wanting anything but homemade. The fettuccine elevates the noodles beyond a vehicle for sauce, which here is restrained with just pancetta, butter and a perfectly fried egg for Vine & Olive's spin on bacon and eggs ($12). Boutz specializes in wine pairings, recommending the 2012 Estola Reserva red, for example, alongside cured King salmon with sweet pickles, thin crackers and a delicate salad of microgreens, shaved celery and parsley ($10). Not sure about that or any other pairing? Vine & Olive also offers 3-ounce pours on all 14 of its wines by the glass. For other questions, just ask, says Boutz, who is meticulous about service and encourages everyone on staff and her customers to share in her passion for food. The original print version of this article was headlined "Dreams Come True"